Ever want to find that hidden gem of fun in the area? No worries, we have so many fun places to explore that we will keep you busy all summer long. Feel free to comment on your hidden gems and then I can add them to the list as well! This is a hidden treasure inside of the Kettle Moraine State Forest Unit-Southern Unit. It is a 17 acre spring fed lake that has a sandy shore with ample grass and picnic tables. I love taking the kids here in the summer and packing a picnic dinner and playing until they are tired out! Lifeguards are not provided. Pets, soaps, food, and beverages are prohibited in marked swim areas. Ottawa Lake is open from 6 a.m.-11 p.m. year-round. Picnic tables, grills, and toilet facilities are available near the beaches. The state parks’ carry in, carry out policy applies at these areas. The lake are tested regularly for bacterial levels. Information is posted to notify swimmers of the water quality of the lake. There is a daily admission per car of $7.oo for cars with Wisconsin license plates, but if you are planning on coming a few times, it is really beneficial to go ahead and purchase a State Park pass that is only $25 for a year long pass which is good at all Wisconsin State Parks. Jelli’s Market – We love Jelli’s Market! Well really, who doesn’t love u-pick farms? This is a favorite of ours, the produce varies through the season and they can be found at various Farmers Markets throughout the summer if you aren’t able to get out to Helenville to pick for yourself. A complete listing of the produce they farm themselves is available on their website along when the produce is ready throughout the growing season. Concord Zoo – This is craftfully hidden behind the Concord General Store located off I-94 just west of Oconomowoc. The zoo mainly consists of farm animals, but the kids still love the experience of getting out and walking about. Hi-Way 18 Outdoor Theatre– Catch a movie at the outdoor theatre! Check their website for up to date information on what is showing and their policies. High Roller Fun Rental– Go tame the dragon, or swan if that floats your boat. High Roller Fun Rental has all sorts of fun from watercraft to bikes to keep you having a blast in Waukesha! Lake Country Rotary Splash Pad – The splash pad is open! The Lake Country Rotary Splash Pad is ready for you to get cooled off in the hottest of days! Located in Nixon Park, in Hartland. Retzer Nature Center – Take a walk into nature and fill your day with exploring Retzer Nature Center, they offer all types of classes and fun events, sure to fill your day with excitement and discovery! Lake Walk Oconomowoc- Take a stroll with the family around Fowler Lake in Oconomowoc. It is about a 2 mile walk to get around. We make sure we stop at Roots and grab a coffee before we start, and we always seem to stop at the bridge at the dam between Fowler Lake and Lac La Belle and watch people fish and stop for a little bit of extra fun at Fowler Park and take full advantage of the park, tennis courts and the restrooms. We park downtown and follow Wisconsin Ave west, then north onto Main St., then right onto Lisbon Rd., then right again onto Greenland Ave, then right onto Oakwood Ave., then right again on Pleasant St. and that takes you back to downtown in the municipal parking lot by the boardwalk. Imagination Station– This is an amazing playground to take your Uncle to. Hmm scratch that, this is just an amazing park in general. It was built from the idea that all children should be able to play together no matter their physical abilities. It is a universally accessible playground with special sensory stations and fully seating swings. There will be a new accessible bathroom built in the end of summer/fall of 2013 to increase the coolness factor even higher. It is locate in Roosevelt Park in Oconomowoc. Milwaukee County Zoo– This is one of our favorite places to go! I always bring a bag of quarters with us to feed the goats. Pack a lunch a plan a day through the zoo. My oldest son always is insisting that we have to find the Zebra, my second son is all about the bears, Batman loves to feed the goats and my daughter is always chasing the peacocks around. There is an awesome train that goes around the zoo, so make sure you wave to everyone as you go by! There are also many specialty events going on too, such as Zoofari, and Feast with the Beasts. 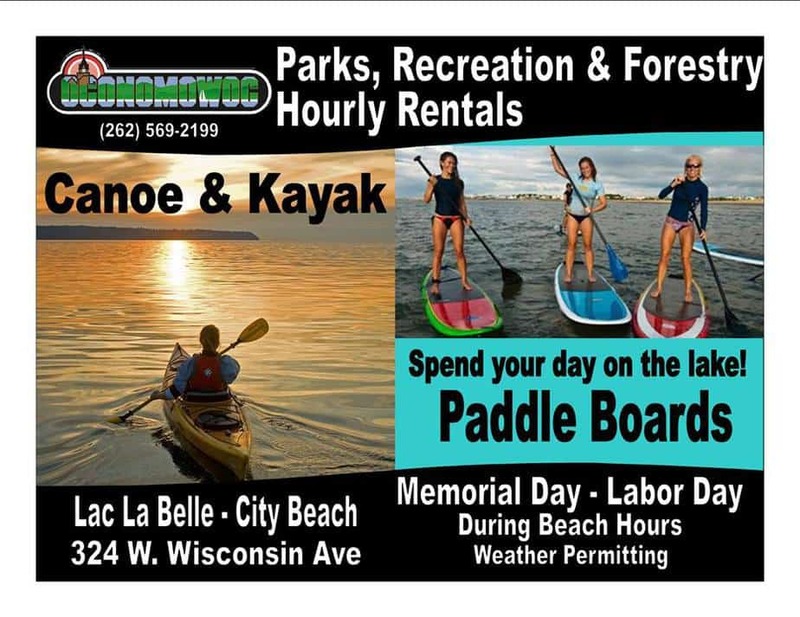 Pewaukee Lake Beach Front– Downtown Pewaukee is a great little spot to getaway. There is no fee to swim at the beach, and it has all sorts of neat little shops within walking distance. We love to head down on Wednesday nights during the summer for Waterfront Wednesdays to hear some live music and have a picnic dinner. If you don’t feel like packing dinner, don’t fret they have a concession area behind the stage with food for purchase. Cushing Park– Located in Delafield, this awesome fort inspired park will delight the kids for sure. Don’t forget there is a path from Downtown Delafield that you can take right to the park that winds by the river and through the marsh. That is a favorite of mine and the kids! Lapham Peak– Located in Delafield, this is a great state park to burn the energy through miles of trails. The forest is open from 7 a.m. to 9 p.m. spring, summer and fall and from 7 a.m. to 10 p.m. in the winter. Freeman Friday Nights– Take a stroll through downtown Waukesha and enjoy many different stages of music. The great part is they shut down all the streets where the stages are set up so there is NO car traffic. It is great when you want to let the kids have some independence yet are fearful of the cars. 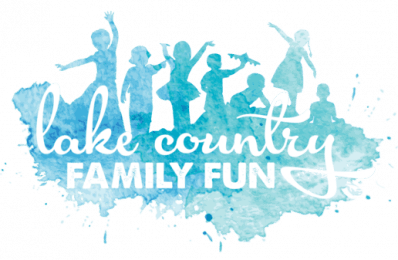 This is a favorite of the Lake Country Family Fun kids! Kiltie– Visit a true gem from days long ago and get your neon and ice cream fix all at the same time. This is a summertime staple in Oconomowoc. Here is a tip, the kids sundae’s are pretty large so we all get those, but we flip them over and dump them into their lids to make it easier on the kids and ourselves while eating. Helium Trampoline Park– Located in New Berlin this is the hottest new hangout. Make sure you buy your tickets online ahead of time to insure you get to jump till your heart is content! Summer Stage– SummerStage is a non-profit organization that provides a unique venue in an outdoor setting for music, theatre, comedy, and dance in the heart of Lake Country, Wisconsin. The Big Backyard– If the weather isn’t cooperating, take a friend and head to The Big Backyard in New Berlin. This is an indoor playground, with a huge jungle gym and ride on toys sure to wear them out! 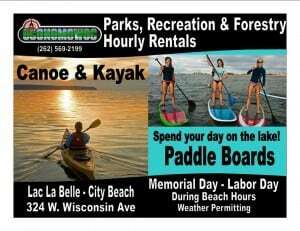 Paddle board rentals are available on an hourly basis. Adventure Rock– Get your climb on! Adventure Rock located in Pewaukee has an indoor rock climbing facility to stop them from driving you up the wall! They are often seen out around town with their portable walls as well. Go Fishing– Head out to a sports store or Wal-mart and get yourself a license for fun. When your kids faces look like those to the right, you know you are making memories! Kids don’t need a license to fish, but if you are planning on helping them, make sure you get one too. Green Meadows– Head on down to East Troy and feel like you are living on a farm. Well at least you can get your boots dirty and have fun with some farm animals. They might even let you milk a cow! LeDuc’s– Head on over to Wales for a custard delight! When we lived in Genessee this was easily a summertime favorite. My sister in law would always have to make a stop for a treat when visiting to really feel like she was ‘home.’ The kids cones are awesome and just the right size for the little ones. Sally’s Sweet Shoppe– Head on down to Genesee Depot and get a sweet treat from Sally’s Sweet Shoppe. Sally is a riot and you are almost guaranteed to leave with a smile on your face. Her creations are about as amazing as Sally herself! Flabbergast– The kids will be jumping for joy if you take them to Sussex to get their silliness out. There are inflatables, arcade type games and a climbing structure. My kids have always left a hot and sweaty mess everytime we have gone here! Naga-Waukee Park Ice Arena– Cool off on the ice if the summer heat isn’t your thing. Naga-Waukee Park Ice Arena is a Waukesha County owned facility operated year round. It offers a variety of experiences for all your skating needs including public skate, birthday parties, youth hockey, adult hockey, figure skating, and learn to skate programs. Moonlit Movies– Catch a flick at Fowler Park in Oconomowoc under the stars! This is a summertime favorite. The August date will take part in Downtown Oconomowoc. Waukesha Guitartown walking tour- Gibson Guitar Corporation has chosen Waukesha, the birth and resting place of Les Paul, inventor of the solid body electric guitar, for an encore of its nationally acclaimed GuitarTown public arts project. GuitarTown Waukesha 2013 will build on the momentum of last year and feature 10-foot tall fiberglass Gibson Les Paul model guitars, regular sized guitars, and professional murals to be artistically designed by local students and nationally acclaimed visual artists, and displayed in front of the city’s landmarks and businesses. Each guitar sculpture and mural will celebrate a musician, personality, or artist unique to the region’s history with sponsorship by local businesses and individuals. Find a pool– Use our handy Cool Off page to find some water filled fun! Holy Hill Climb-Visitors can climb a 178-step observation tower to view the Milwaukee skyline 30 miles away. Scenic Tower is open daily May 1 to October 31 (weather permitting) Sunday: 1:30 pm — 6:30 pm Monday – Saturday: 9am – 6:30 pm THE SCENIC TOWER stretches 192 feet from its base to the tip of its spire. By climbing 178 stairs, you can reach nearly to the top to view a breathtaking panorama of the Kettle Moraine area. Because there are open areas in the design and structure of the tower, it will be CLOSED when the following conditions are present: Gusty or high winds,threatening weather, fog, rain, electrical storms, wet stairs following a storm, frost & snow. The ENTRANCE to the tower is on Level 2, to the right of the Chapel of St. Therese. Free will offerings are gratefully accepted to help defray costs for maintenance and repairs. Nagawaukee Park-The park offers a spectacular view of Nagawicka Lake as you meander down the boardwalk to the boat launch or beach. Another boardwalk awaits you as it winds through the trees along the lakefront. It is a splendid view and a great photo opportunity. The oak hickory forest and thick undergrowth define the trails that wind throughout the park, which is home to many different species of wildlife. Many Baltimore Orioles make Naga-Waukee their home, as well as Great-Horned Owls. Ella’s Deli– Your eyes will not know which way to look when you step into Ella’s Deli in Madison. I took the kids this summer for our first time and I kept hearing squeals of happiness when they would discover something new! This is a great place for a game of eye spy while waiting on your food. Don’t forget to buy a token for the merry go round outside when paying for your bill.